Finally we saw the sun yesterday, a glorious day, bright blue at first and then one of those extraordinary, huge skies you get up here crept in - high up in the stratosphere a massive ribbon of mackerel clouds seemed suspended over us all afternoon. 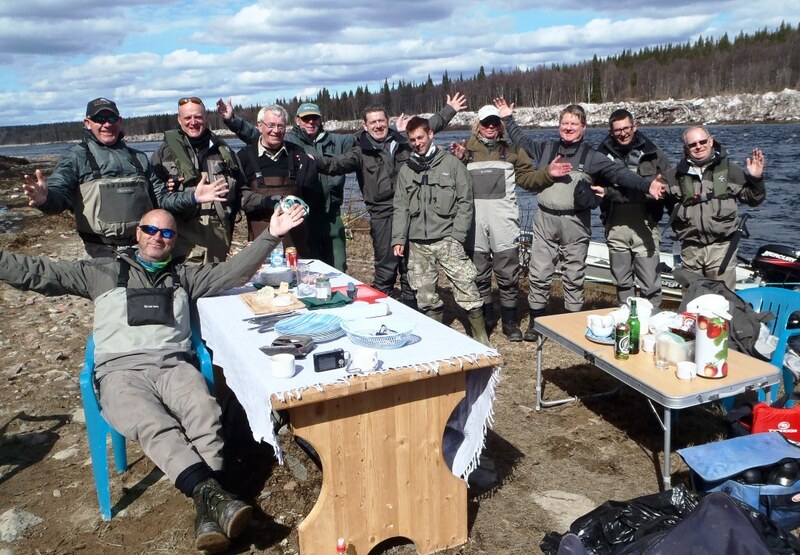 A wonderful day to be out fishing albeit not ideal conditions from a catching point of view but we all enjoyed the first taste of summer on the edge of the Arctic Circle. In the evening I went up to Middle Camp to see how they were getting on. 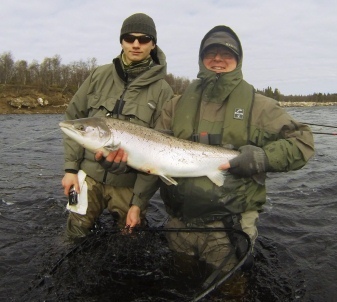 The water temperature had climbed to 9⁰C, the team reported seeing a great number of fish moving through but they were harder to catch than previously. They are pretty keen up there at Middle Camp as Varzuga blog watchers will know and by the time Jemima brought the cheese to the table there were only 3 of us left to enjoy it – the others had politely excused themselves and were scrambling back into waders for a last go down Generator and Bear before the air temperature dropped too far. Hugh did not have a definitive score for me this morning as a few had had another cast or two before breakfast but reckoned they were over 50 again for the eight rods. Charles H at Lower also had a cast before breakfast this morning and gave us encouragement by banking a cracking fresh fish of 9lbs before his fried eggs and bacon. 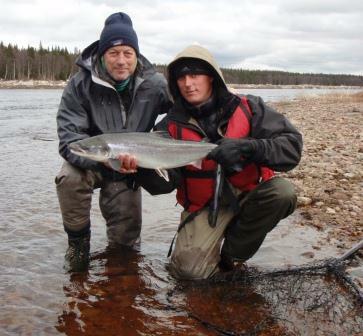 Yesterday we had 53 salmon at Lower, a good day capped off by a master class of guiding by Feodor. At 18:00 prompt, when the other boats were parking up he dropped anchor off the camp lawn and Michael and Alan had three double hook ups with a gallery of spectators cheering them on. 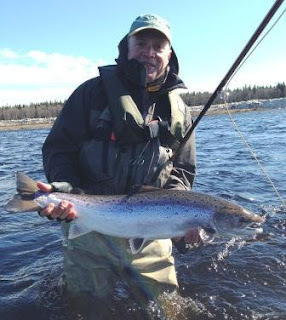 Tom at Kitza had an hour on Heli Pool yesterday afternoon, the water temperature, as always on Kitza, was a touch cooler than here at 5⁰C, he landed two fresh salmon on an intermediate tip and a Cascade. There is every prospect of Kitza getting off to a really good start this Saturday. We depart early tomorrow morning for Murmansk, I’ll try and get a quick update through before we go. Charlie will take over from me and I’ll be back in England for a couple of weeks, deeply envious of those up here on this magic river. After a tricky day on Tuesday normal service was resumed yesterday with Middle Camp recording 64 salmon and Lower Camp 67. A much easier day, by no means warm but by midday you could have called it ‘soft’; the evening was overcast, the air temperature held up until almost midnight and it was distinctly fishy. At Middle Julian T hit a really big run of fish coming through Party Pool and had 15 by lunch time, he ended up top rod for the day with 20. Again the beats from Snake Pit and down are fishing best, there was a sort of attempt to get up Yovas Rapids, but I guess that the crackle of radios recording fish caught lower down was too much of a temptation and we have not really explored up-stream yet. At Lower the start was a bit ragged after a well-deserved late night and we were a couple of men down for some of the day. The Senior Team of Alan J and Michael H had 12 salmon each, the third day out of four that they have each caught exactly the same number, they did much of the damage in Morskoy which was loaded with new fish in the afternoon, Michael had trouble keeping them on and reckoned that if he’d landed all he had hooked he would have had well over 20. At dinner we knew that Middle Camp were on about 60 for the day and we decided that we had to stay ahead of them (only to please our guides here you’ll understand! ), so we took advantage of our warmest evening yet and in an hour and a half added another 7 fish to the book just to be sure that we’d be ahead of Middle. In fact that has been our only ‘out of office hours fishing’ so far. Today has dawned bright and clear, great to see some sun back. 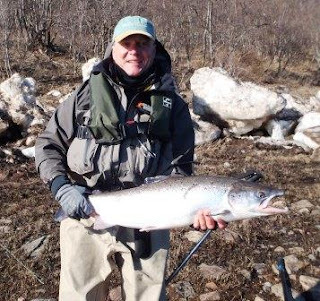 Tom at Kitza was planning some test fishing with Ura today and if I hear from them this evening I’ll let you know how they got on. If it stays bright the water temperature should climb a bit today, the height continues to drop, and that will be the norm unless we get rain. 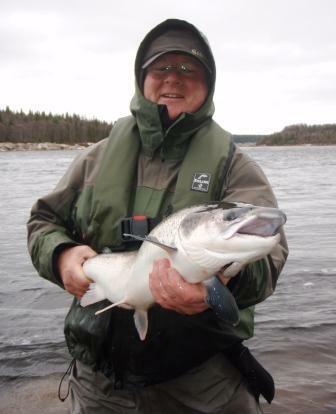 Oliver L who first fished Varzuga in June 1991! Floating lines and intermediate or slow sink tips are working well. Flies are the usual eclectic collection according to personal preference, size ought to be 1" - 2". If in doubt use the Ally's Shrimp or similar pattern. We flew over to Kitza yesterday taking Tom and Donna and a full load of supplies. Ura and Luba were there to greet us; wonderful to see them again and enjoy the peace and quiet of that special place. 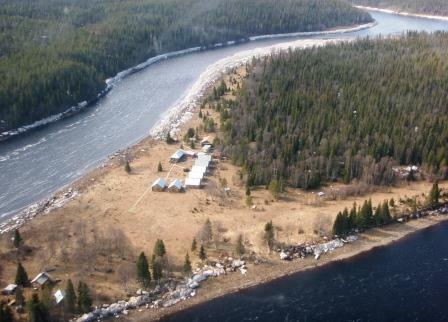 The camp looked well up together, Ura and the team have been busy building a new store beside the kitchen, the banya floor has been repainted and a new floor put down in the dining/sitting room. With the new wooden dining chairs (like Middle Camp – finally!) it was all looking pretty good. Donna was thrilled to find a brand new cooker and for Tom there was a new generator. Glenn did a ‘once over’ on all the outboards, we left them a spare one and lots of spare parts then flew back in the evening to Lower Camp. ﻿﻿﻿On the way over Tom had a text from David P requesting the breaking news on river height and temperature etc. 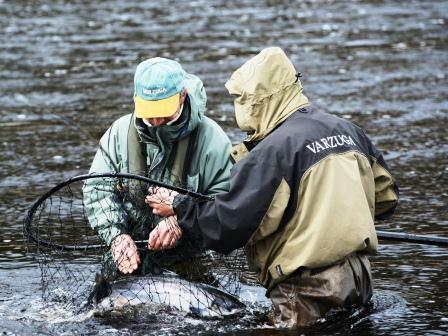 So, David and all you keen Kitza fishers, here is the news and some rather dull, grey photos – it was that sort of light that I think even Matt Harris would have been challenged to take a decent shot. The water height looked perfect, just off the scrubby bushes in Heli Pool. The water temperature was 4.5⁰C which was pretty much what we expected. Camp Pool looks a touch high at the moment, it is really a medium/low water pool. 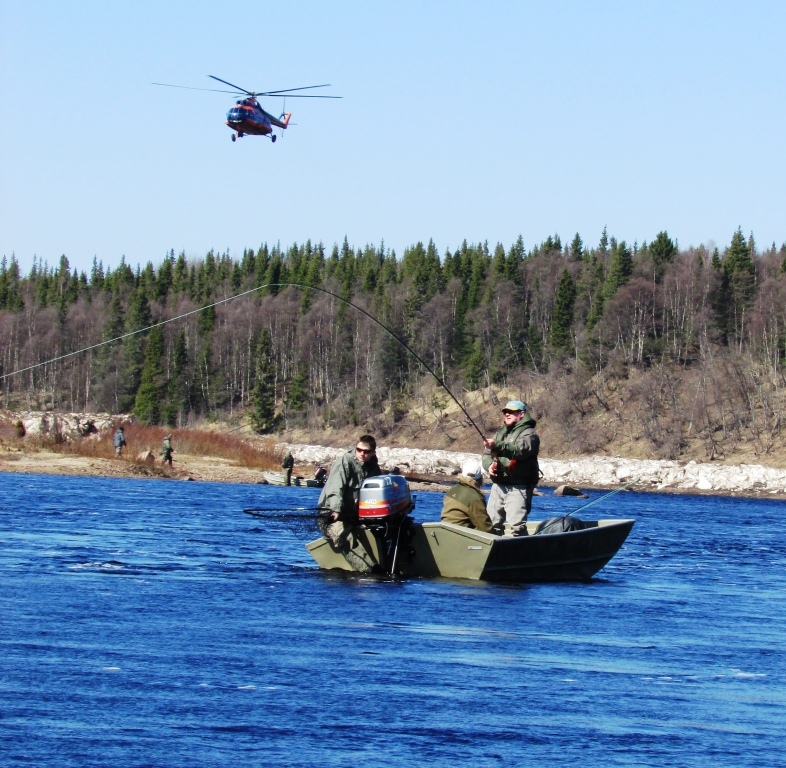 From the air Sasha’s Pool was begging to be fished – yet again time did not permit a quick go and we left Tom pretending that he had lots to do and would not fish for a day or so, but knowing full well that as soon as our helicopter noise had faded to the West he would be doing a little test fishing just to satisfy himself that the salmon really were there. As always things can change but the start at Kitza on Saturday looks promising and thankfully no repeat of the very high water of last year. On Lower and Middle yesterday conditions were tougher – none of us really know why, the fish are here in good numbers but they were just ‘off’ for some reason. 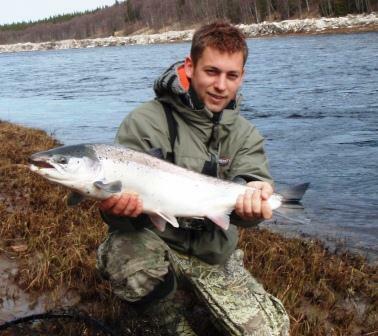 But ‘off’ on Varzuga is slightly different compared to other rivers and Lower Camp managed over 50 salmon on the bank. 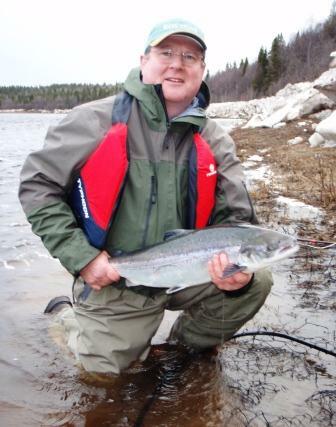 Yet again Richard M showed us how to do it and has now landed 57 salmon in just three days. As I mentioned on the blog yesterday we have some really chunky fish coming through and we had several yesterday well into double figures; every salmon seems to be straight in from the sea, in wonderful condition and with that translucent purple, silver and blue sheen to them. Hugh also reported a trickier day at Middle, they had 38 up to dinner with a few guests determined to go back out afterwards. 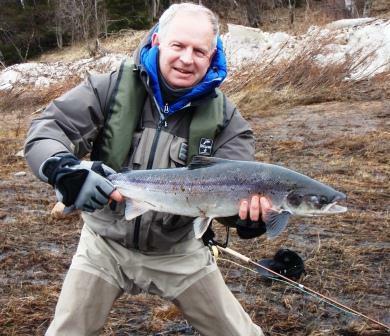 Bizarrely the pool of choice at this time of year, Clarkes, yielded only one fish for the day – an unheard of event! 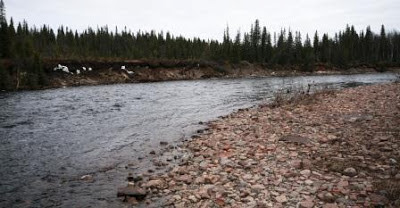 The water temperature was only 4⁰C yesterday so it is unlikely that the salmon are pushing on fast, but to explore a bit Hugh will push a team or two up Yovas Rapids today to see if there are pods of fish in the many resting places they make use of in the canyon. Matt L with one of 7 salmon he landed yesterday - his third day salmon fishing! Today is another rather grey, dull day, quite chilly still and we’d love a day or so of sun. The air temperature is stuck at 5⁰C and the water temperature the same. Jamie has just left to prepare a salmon BBQ at Bear Corner for lunch – not exactly BBQ weather but that has not dimmed his Aussie enthusiasm. A damp morning yesterday so we decided to have lunch back in camp. At 1 p.m. the boats came in and it had clearly been a productive morning for most of the rods. There was quite a bit of tackle talk and various lines were changed and adjustments made before all set off for the afternoon session. As we thought, the best combination at the moment is a floating line with an intermediate or slow sinking tip and a brass or aluminium tube fly of 1” – 2”. The water dropped a couple of inches and Sharks Tooth rock, here in Heli Pool at Lower Camp, is just beginning to show. By the afternoon the water temperature was up to 6⁰C, after a hard frost again last night it is back down to 4⁰C this morning. At Lower Camp we landed 89 salmon to our 11 rods with four guests getting into double figures, notably Richard M with 16 and Robin M, who had not caught a salmon 24 hours ago, with 13. 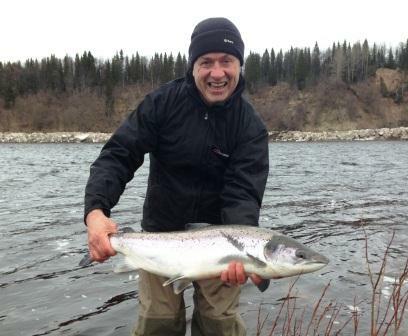 Indeed four of our rods caught their first salmon – a really encouraging start to the season. ﻿Above us at Middle Camp they had at least 60 fish to eight rods in addition to the 20 landed on Saturday evening, several had fished late last night (Sunday) and Hugh did not have a final score this morning but was more than happy with the first day. The ice walls have not hindered fishing to any significant degree and only the lower half of Clarkes and a section of Party are affected. 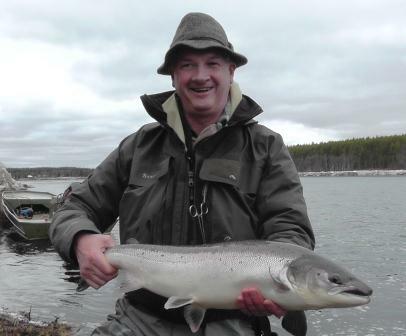 In a similar vein to last year, a number of regular rods commented on the size and great condition of the salmon this season. Michael H had a super fish of about 14lbs and there were several other real trophies in the record book at the end of the day. 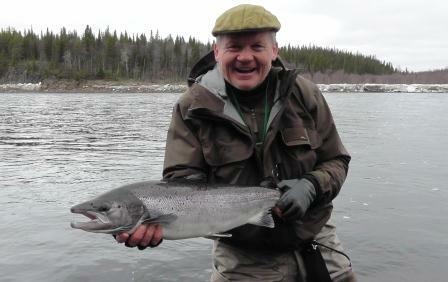 ﻿﻿﻿The rods were off promptly this morning - keen to make the most of the river in such good condition. After a reasonably mild day yesterday everyone is well wrapped up, the air temperature is 5⁰C although with a chill wind from the North East it feels quite a bit colder than that. 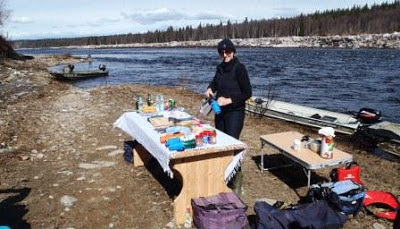 We will have lunch on the river rather than haul back into camp and Maryke is busy preparing lashings of soup and a hot meal that we will run down the river for them. An encouraging start! Tonight I will go up to see Middle Camp and will have a first hand report for you tomorrow. Our first guests touched down 20 minutes early at Murmansk airport, we were soon on our way to camp and we were on the river for a bonus few hours fishing by 5 p.m. with a later dinner at 9. 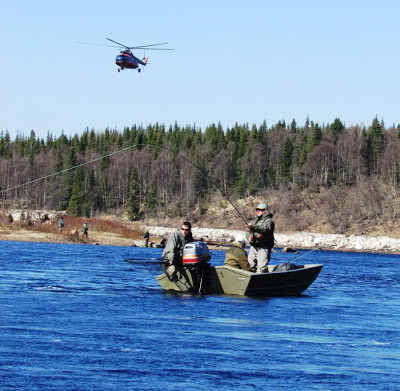 ﻿I know I have written the same comment for the last three years – but it really is great to experience the enthusiasm shown by the first guests as they get out of the helicopter and stroll (actually, it is more of a sprint if the truth be known) to look at the un-fished river loaded with spring salmon. 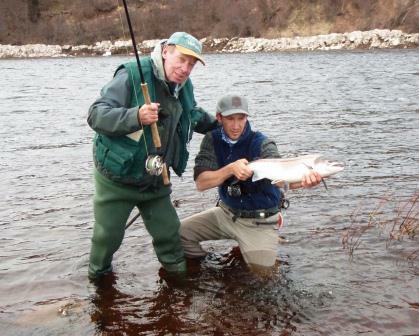 Here at Lower Camp we were quickly off the mark with Alan J landing the first fish in Heli Pool. 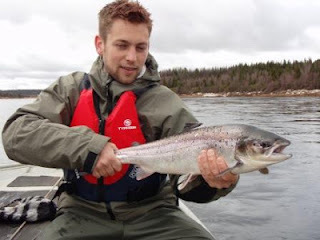 Matt L and Robin M both had their first ever salmon, in fact Robin landed three in a busy hour in Larder and lost a couple. We had nine on the bank by dinner and although it was a mild evening, and we could have gone back out, we called it quits and hit the sack ‘reasonably’ early after a little celebration. ﻿﻿At Middle the eight rods had 18 salmon before dinner with most coming off the lower section of Generator. 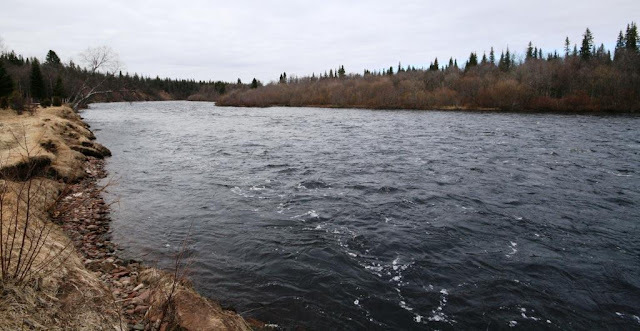 Bear has some big ice walls on it but is fishable although only produced a couple of fish last night, but it will improve as we get progressively more access to it. It started raining last night and today is pretty damp and grey, it is forecast to stay this way for the next 24 hours. The water height was steady overnight however I would expect some sort of rise over the next day or so. The water temperature continues to remain around 4⁰C which is perfect for this time of year. 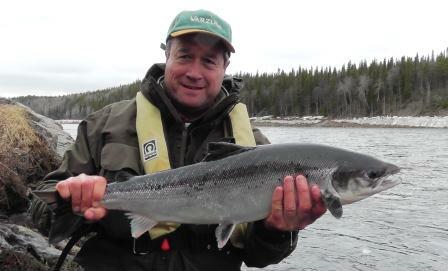 We caught fish on floating lines with intermediate tips yesterday evening which was encouraging. The text book would dictate a medium sinking tip but in this slightly lower water than normal it seems less important to get down really deep. ﻿As I type, at the dining table with a great view over the river, I have half an eye on Michael and Alan guided by Feodor on the opposite bank in Larder. Feodor has been quite active with the net so I guess they are doing well. I’ll update you tomorrow; in the meantime I think we might have a productive week!